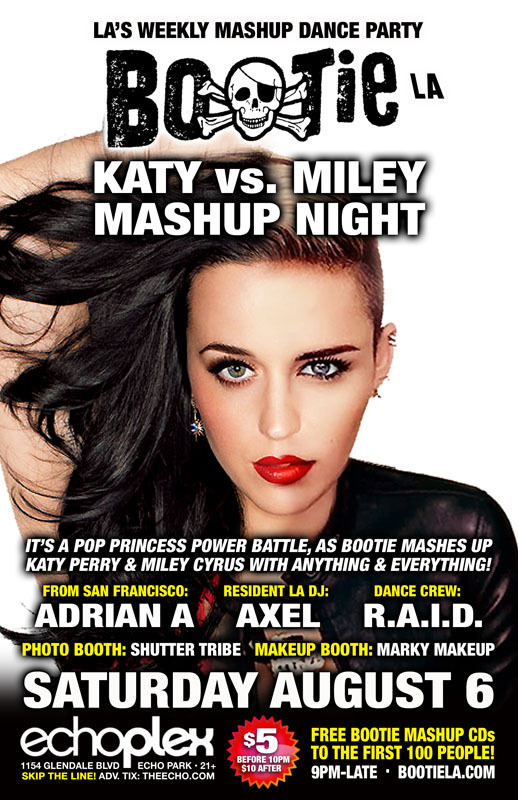 It’s a Bootie battle of the pop princesses, as Bootie mashes up Katy Perry and Miley Cyrus with anybody and everybody! No era or genre is safe! Only $5 before 10 PM! Bootie takes the songs of pop princesses Katy Perry and Miley Cyrus — from big hits to deep cuts — and gives them Bootie treatment, by mashing them with anybody and everybody! Bootie co-founder Adrian A comes down from San Francisco to join resident DJ Axel on the decks. Resident dance crew R.A.I.D. (Random Acts of Irreverent Dance) takes over the stage with their usual go-go antics, while Marky Makeup gives your faces and bodies a glittery makeover, and Shutter Tribe captures all the fun! All this, plus FREE Bootie mashup CDs for the first 100 people through the door!